A year ago the English publisher Quarto commissioned me to do a series of paintings for a book (working title) “Must Paint Watercolor Flowers” and at last it arrived in the mail! Now named How to Paint Watercolor Flowers: Create Your Own Masterpiece in 6 Easy Steps, it features my paintings and those of 15 other artists, along with step-by-step instructions showing how we made our paintings. The book has 160 pages and at 11″x 9.5″ is much bigger than their “Watercolor Artist’s Bible” in which I also had several paintings. It is laid out with a beautiful 8×10 photo of the flower subject on the left side and photo-illustrated step-by-step instructions for creating the finished watercolor beside it. Hard-cover spiral binding allows the book to lay open flat for artists who wish to try the techniques while painting from the photos. I loved seeing the beautiful work of the other artists and the many ways they approached the wide variety of subjects and techniques. The flower photos are superb, with permission granted to use them for your own paintings. 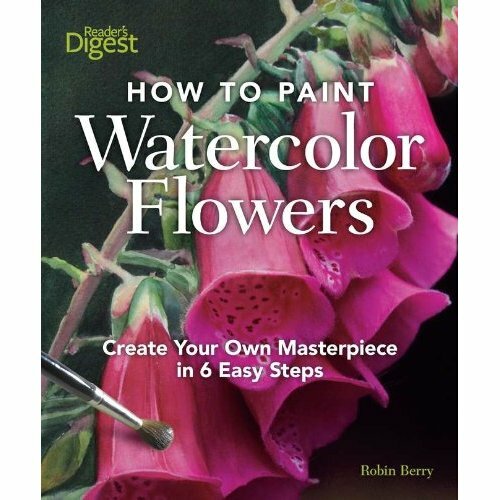 The book also has excellent sections on watercolor technique, color, value, and photographing your own flowers for painting. I haven’t read all the step-by-steps, but I’m guessing that like me, few of the artists actually created their work in just the six steps that we were limited to when writing up and photographing our work. Instead the editor highlights the key techniques that were especially important to each particular painting. If you’d like to see my work in the book with more steps than were published (on pages 41, 65, 131), you can see them on my blog (Sunny Serenade Part I, Part II, Part III; Pink Orchid, Becoming Begonias). Disclaimer: I have no financial investment in the book; I was paid per painting for the publisher’s right to print my work, but receive no royalties or other benefit from sales of the book itself from the publisher or via Amazon links. Congratulations Jana! What a thrill – I’m so proud to know you. Every reference book I’ve bought from the Reader’s Digest has been worth its weight in gold. Looks like ‘yours’ joins that number! Congratulations! Congratulations!!! Your painting is wonderful and certainly fits in well with this book. An honor well deserved! Has it already been a year?? I remember when you were posting about that. Where did the time go? Congratulations! the pain is gone. And how lovely they are. flowers. Taught me a lot. And such fun, all of it. Congratulations, Jana! Another publication – another great accomplishment! Thanks everyone. It is truly an honor! You must be so proud! Congratulations and please continue to share you work. I really enjoy see your posts. I saw the book in the UCD bookstore, it looks great! Congratulations!